The most important test for any prospective Seahawks lineman? When the Seahawks consider which offensive linemen to draft, the broad jump is the single most important test they consider. Allow me to present the evidence. Glowinski and Poole ranked joint first among offensive linemen at last years combine in the broad. Garry Gilliam, an undrafted free agent and now possible starter at left tackle, also jumped a 9-5. Alternatively, since 2012 the Seahawks have not selected any of the 15 best O-line performers in the short shuttle or three cone at the combine. It doesn’t look like a coincidence. The selection of Justin Britt in 2014 was a surprise because he wasn’t on anyone’s radar as a second round pick. The Seahawks, seemingly enamoured with upside and athleticism, took a player who ran an 8.14 in the three cone and had a 4.69 short shuttle — both terribly mediocre results. For that reason it was assumed Britt was merely a ‘Tom Cable guy’. A prospect Cable simply liked irrespective of any athletic profile. This likely wasn’t the case at all. Britt performed well in the one test that seemingly really matters — the broad jump. He recorded a 9-3 at his pro-day. It was revealed this week that Cincinnati offensive tackle Justin Murray has visited the VMAC for a private workout. He managed a 9-8 broad jump at his pro-day. That would’ve ranked #1 at the combine this year. If you ever wondered why the Seahawks zoned in on Glowinski, Poole and Britt — the broad jump gives you an answer. So what is the likely reasoning for their focus on one particularly explosive test? Jason Spriggs had the best broad jump by an offensive lineman at the 2016 combine with a 9-7. Fifteen defensive line prospects beat that mark. Fifteen. It’s another key example of the athletic discrepancy between the defensive and offensive prospects entering the NFL. Sheldon Rankins and Jonathan Bullard — two big DE-DT hybrids — jumped a 9-10 and a 9-8 respectively. Both beat Spriggs’ mark. If you want to know why the Seahawks focus on measurables — and ultimately why we spend a lot of time talking about them — there’s your answer. If you’re expecting a guy who only jumps an 8-0 like Evan Boehm to play center against a defensive lineman who explodes to the tune of a 9-10 in the broad — you might have a problem. So much of the O-line battle is based on that first-step explosion and power. Moving people off the LOS with a sudden, explosive movement is key (especially if you want to run the ball effectively as the Seahawks do). The broad jump is a good test of a players ability to do that. Agility is a nice bonus — but if you can’t move people off the line, what difference does it make? This is likely why the Seahawks are keeping Kristjan Sokoli at center — with his 9-11 broad jump. Sokoli’s mark for an offensive lineman is outstanding. In reality, he’s only as explosive as Sheldon Rankins. Unfortunately there are barely any O-liners in college who can say that. And that’s why the Seahawks are looking at defensive converts. So considering the Seahawks have consistently drafted good broad jumpers since 2012 and have not prioritised the best performers in the agility tests — what does it tell us about the 2016 class? It’s worth taking into account size with these numbers. Germain Ifedi jumped his 9-1 at 324lbs. Alex Redmond is 294lbs, Joe Thuney 304lbs and Jake Brendel 303lbs. Le’Raven Clark recorded a 9-1 in the broad at his pro-day. Shon Coleman has not performed any tests so far due to injury. I’m not prepared to state firmly that the Seahawks won’t draft Conklin, Kelly and Decker in round one based on one test. Yet Seattle’s recent draft history would seem to indicate that could be the case. Spriggs, Ifedi, Whitehair and Clark might be the most likely O-line targets at #26. That’s with the caveat that Carroll and Schneider haven’t drafted an offensive lineman with sub-33 inch arms (Whitehair would be the first). Haeg, Dahl, McGovern and Thuney could be potential targets in rounds 2-3. We can probably forget about Martin, Garnett, Allen, Boehm, Tretola and Westerman. It also means a prospect like Justin Murray, with his explosive 9-8 broad jump, could be preferred on day three to some of the bigger name prospects in rounds 1-3. Keep an eye on any future VMAC visitors and how they performed in the broad. The difference between the two is one pound in weight and Fackrell’s split is 0.04 seconds quicker. It’s something to keep in mind if you’re wondering whether Fackrell could be a target for the Seahawks. By the way, the tape above is another exclusive video you won’t find anywhere else. Thanks to our man Justin P for some great work yet again. Only two players have had a quicker short shuttle than Frank Clark at the combine since Pete Carroll joined the Seahawks in 2010 — Alex McCallister (2016) and Bruce Irvin (2012). Clark had the #1 short shuttle (4.05) in 2015 and the second best three cone (7.08). He also had an explosive 38.5 inch vertical — fifth best by a defensive lineman since 2010. Basically, he is the definition of a NFL freak. So how does Clark compare to arguably this years closest version — Emmanuel Ogbah? They are similar in size (6-3, 271bs vs 6-4, 273lbs). Ogbah’s 4.63 forty beats Clark’s 4.79 handsomely. Yet in the explosion and agility tests Clark is far better. Ogbah’s 35.5 inch is three inches shorter, his three cone is 7.26 vs 7.08 and look at the difference in the short shuttle — 4.05 vs 4.50. That’s significant. Nobody in this class gets close to Clark’s combination of size and agility. Shaq Lawson managed a 4.21 in the short shuttle and a 7.16 in the three cone. That, plus a reasonable 1.64 ten-yard split, is the likely reason some are projecting him as a top-15 pick. Clark’s combination of freaky size and athleticism is exactly the type of thing the Seahawks have looked for in the early rounds. This was clearly evident in the two trades for Percy Harvin and Jimmy Graham — plus the 2012 selection of Bruce Irvin. Nobody in this class has that type of talent. So if you’re hoping to see an EDGE drafted early as opposed to a SAM/DE or a DE/DT, you might be disappointed. It might be one of the reasons they look instead to a guy like Fackrell or a DE base/DT nickel hybrid. The Seahawks drafted three of this list and converted two of them to offensive linemen. It’s not overly surprising when you look at the top 2016 O-line performers in this test. Tyler Johnstone and Jake Brendel rank joint first with a 7.31. Cody Whitehair is at #3 with a 7.32. Jared Smith, a D-line to O-line convert project, ran a 7.20. There’s the difference in athleticism between defense and offense that everybody talks about. It’s why Justin Zimmer might be a candidate to be their latest convert — if they can see beyond his shorter arms. Zimmer reportedly ran a 7.01 at his pro-day. Joel Heath — another player we’ve discussed as a possible O-line convert, ran a 7.44 — very similar to J.R. Sweezy. If the Seahawks place a premium on the agility tests (three cone, short shuttle) — Bronson Kaufusi’s 7.03 at 6-6 and 285lbs compares well to the top names listed above if you consider him a candidate to work inside and out. He also had an excellent 4.25 in the shuttle. Jonathan Bullard ran the best three cone for a defensive tackle this year at 7.31 which is comparable to Gerald McCoy and Geno Atkins. Sheldon Rankins managed a 7.44. I was asked recently about Jordan Hill’s athletic profile. Looking through the numbers today brought up an interesting statistic. Hill only managed a 22.5 inch vertical and a 5.23 forty. His excellent short shuttle, 33.5 inch arms and big hands were likely what convinced the Seahawks to spend a third round pick. Jaye Howard probably isn’t considered a major athlete by fans either as they recall the fourth rounder spent on him back in 2012. He actually had a 4.47 short shuttle. Again, look how that compares to the top performers in this draft class. It’s not a definitive review of what they look for in an interior pass rusher — but they haven’t drafted many interior rushers since Carroll took over. The two best examples we’ve got suggest the short shuttle is imperative. There aren’t many good short shuttle times among this much hyped DT group. As intriguing as Javon Hargrave is based on tape — he had one of the poorer shuttle’s (4.70), he only has 32 inch arms and his mitts are an inch shorter than Hill’s. That said, Hargrave’s vertical is 12 inches higher and he ran a much quicker forty. Perhaps Hargrave’s explosive jump and sprint are as intriguing as Hill’s great short shuttle? That’s one possibility. The other is they really value those short shuttle times and zone in on short area quickness and agility. If that’s the case, they might be more likely to focus on Bullard (4.56), Willie Henry (4.53) and Ronald Blair III (4.53) to boost the interior line. All three can work the DE-DT position we’ve been talking about. Cassius Marsh had the second best short shuttle in the 2014 draft (4.25) second only to Jackson Jeffcoat (4.18) who the Seahawks signed as an UDFA. Marsh’s 7.08 three cone ranked third, again just behind Jeffcoat. Marsh’s two agility tests were better than Aaron Donald’s and Jadeveon Clowney’s. If you’re wondering why he’s a candidate to switch permanently to SAM linebacker — there’s your answer. If Frank Clark and Bruce Irvin weren’t evidence enough of this team pining for freaky athleticism and agility — Marsh is another classic example. What about the offensive line? We talked recently about the possible importance of agility due to Russell Wilson’s willingness to improvise. Yet since Wilson was drafted in 2012 the Seahawks have not selected any of the 15 best O-line performers in the short shuttle or three cone at the combine. Indeed, Justin Britt had lousy times in both tests (8.14 three cone, 4.69 short shuttle). However, that doesn’t mean the Seahawks haven’t recently focused on greater mobility on the O-line. Kristjan Sokoli — who the Seahawks converted from defense to center — ran a 7.25 three cone and a 4.36 short shuttle. Garrett Scott — a 2014 draft pick — ran an excellent 7.09 in the three cone and a 4.40 in the short shuttle. He wasn’t invited to the combine. Earlier we highlighted Jared Smith’s 7.20 in the three cone. He was another defense-to-offense project. There’s a number of names on the list from last year that theoretically could’ve been targets for Seattle. Jake Fisher, Ali Marpet, Cameron Erving and Ty Sambrailo were off the board before Seattle’s pick. All four ranked in the top-five in the three cone in 2015. 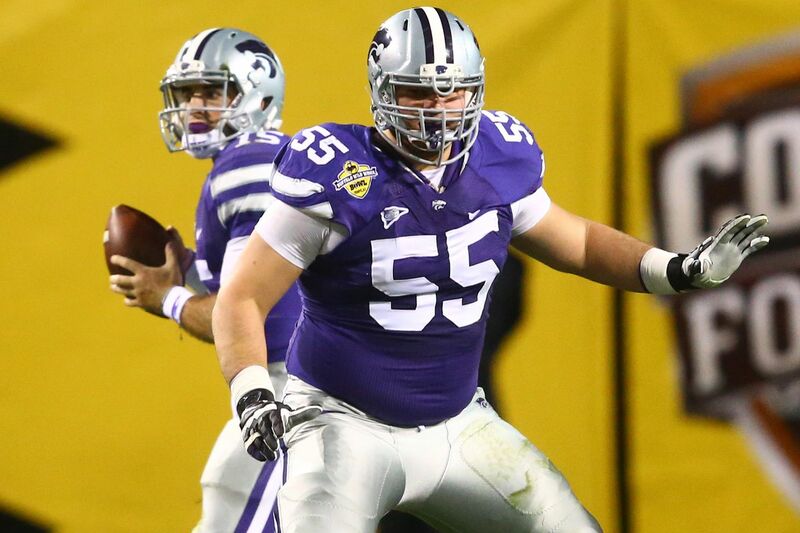 Mark Glowinski, who the Seahawks did draft, ranked sixth. Even Terry Poole managed a 7.66 three cone which is similar to Jack Conklin and Joe Dahl. Athleticism and mobility, based on the 2015 class, might be a greater focus. And if you believe they were interested in Marpet or Sambrailo — then you’ll be invested in the possibility of Cody Whitehair, Joe Haeg or Connor McGovern being options. The knock on Whitehair is they haven’t drafted a single offensive lineman with sub 33-inch arms in the Carroll/Schneider era. The broad jump might be the measurable they focus on more than most based on recent history. Since 2012, Mark Glowinski and Terry Poole rank in the overall top-15 among offensive lineman (both jumped a 9-5). In this years class only Jason Spriggs beat that with a 9-7. Joe Haeg jumped a 9-3, Cody Whitehair a 9-2, while Germain Ifedi, Joe Dahl and Connor McGovern all jumped a 9-1. Whitehair (1.73), Haeg (1.75) and McGovern (1.72) also had good 10-yard splits for their size — with McGovern adding a massive 33 inch vertical. It’s another tick in the box for some of these potential targets. At least a couple of these players might be playing in Seattle next season. Texas Tech’s Le’Raven Clark hasn’t completed a three cone or short shuttle due to a hamstring injury. He could also be in the reckoning. Time to mix things up a bit. This mock includes one trade. The Rams move from #15 to #10, giving the New York Giants the #43 pick and a late round selection in the process. RGIII provides the Browns with a holding starter if they want to draft a quarterback at #2. But what if they decide there isn’t a definite franchise quarterback in this draft? For a team that is probably 2-3 years away from realistically competing, collecting talent could be the order of the day. Hue Jackson will believe he can turn Griffin III into a viable starter for now and that could influence their decision here. If they’re going to try and train a starter for the longer haul — perhaps they consider Cardale Jones at the top of round three? It’s high time someone in the league took a page out of Green Bay’s book. Aaron Rodgers clearly benefitted from a spell sitting behind Brett Favre. Philip Rivers is 35 this year so planning for the next era at quarterback would be a smart move by the Chargers. They can compete with their existing quarterback while planning ahead. In 2013 the Rams gave up essentially a second and seventh round pick to move from #16 to #8 for Tavon Austin. With two second round picks they might make a similar move here to secure a long term answer at quarterback. Chicago and New Orleans could be planning for the future at QB and might be surprise suitors for Paxton Lynch. No big shocks here. Conklin deserves to go this early as a legitimate top-15 prospect in the draft. He tested better than expected at the combine, he’s a self-made man and, for want of a better phrase, he plays with massive stones. We’ve talked for months about the possibility that Ronnie Stanley might fall a bit. His reputation is a little bit bizarre. It’s hard to remove the memory of Stanley tackling Shaq Lawson from behind after a horrific attempt to block him. His three cone and short shuttle were horrendous at the combine. We know how Scot McCloughan builds his teams and Washington will soon start to resemble the Seahawks minus Russell Wilson. I can see McCloughan being really interested in Jonathan Bullard and Keanu Neal. Neal has been invited to the draft — another indicator that he’ll go a lot earlier than most of the media are projecting. He’s a top-25 talent. Both Bullard and Neal are athletic, high character, intense football players. They want to be great — listen to their interviews. You can build around guys like this. The Seahawks have a choice of either Germain Ifedi or Cody Whitehair. I stuck with Ifedi for now purely due to his freakish size. If you want to swap these guys around and put Whitehair at #26 — feel free. Both players would project to start at left guard and the Seahawks have favoured size in that role previously which is why I stuck with Ifedi. Whitehair is an intriguing alternative though, as we discussed on Sunday. With Bullard and Sheldon Rankins off the board — it looks like a pretty easy decision for the Seahawks to go O-line at #26 in this scenario. Had either player been available I would’ve been extremely willing to project them to Seattle. The Browns need a weapon at receiver with Josh Gordon’s career still in limbo. Doctson would provide a big catching radius and a reliable pair of hands. He’s certainly not A.J. Green but he could at least provide a similar safety net for RGIII and Hue Jackson. If the Titans are going to commit to taking another offensive tackle at #1 — they might as well add the best guard in the draft too and go the whole hog. With Whitehair, Tunsil and Taylor Lewan they’d be challenging the Dallas Cowboys for pure O-line talent. Jason Spriggs tested well at the combine but so did Jake Fisher a year ago. Spriggs isn’t a particularly fierce run blocker and he gets beat inside way too much for a guy with his length. He might last a bit longer than people expect. Speaking of players who might fall — keep an eye on A’Shawn Robinson. He carries his weight well and looks the part of a solid NFL defensive lineman. On tape he just doesn’t make enough plays. Someone might buy into his frame, attitude and purported upside in round one. He could also drop into the 30’s. Noah Spence didn’t test as well as expected at the combine. As a smaller one-dimensional speed-rusher without elite quickness — how do you justify putting him in round one? A drop into round two is very possible. Robert Nkemdiche has issues he needs to sort out before starting a career in pro football. We’re not talking about a one-off, isolated ‘college kids’ incident here. We’re talking about a back-catalogue of problems involving both Robert and his brother Denzel. Drugs, violence. He’s an even more serious case than Randy Gregory who dropped into round two last year. If anyone is going to take a chance, Jeff Fisher is probably the guy who will. Travis Feeney’s shoulder injuries are concerning but players with his combination of speed, athleticism, production and versatility are snapped up quickly in the NFL. He is an ideal fit for the Jets — Todd Bowles likes to utilise a roaming linebacker/safety hybrid who can rush. Without the shoulder issues he could’ve risen like Deone Bucannon. Continuing with Washington’s theme of tough, athletic football players — Joshua Perry is an ideal fit. They use a 3-4 scheme and he can slot into the middle linebacker spot, make plays and lead that defense. With several possible EDGE and DT prospects off the board before Seattle’s pick in round two — they instead opt for a rush-linebacker with great flexibility. Fackrell can line up at linebacker similar to Bruce Irvin and he can put his hand in the ground and attack the edge. They might prefer to add a DE-DT instead who can play base and nickel in the D-line — but they can’t fight the board here. Fackrell is a high-character splash-play specialist. He lives in the backfield and impacts the quarterback. He’s athletic and explosive. The Seahawks recently met with Shea McClellin before he signed with the Patriots. Fackrell would play a similar role in Seattle. He’s a playmaker with the character that fits this team. He’s underrated. This is likely the range where we start to see some running backs coming off the board. Tyler Boyd just screams Green Bay — and we know they like to add receivers in round two. Austin Johnson’s all-action style and ability to play nose tackle, three-technique and D-end makes him an attractive second round option. Whether they go O-line-D-line or vice versa with their first two picks, the Seahawks would have an opportunity to add a running back and another O-liner in round three. 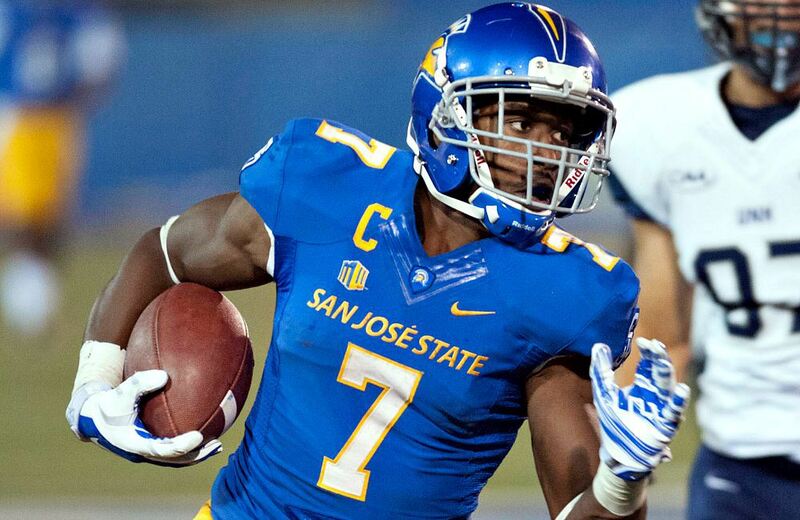 San Jose State’s Tyler Ervin continues to look like an attractive proposition and Darrell Bevell met with him during his pro-day. Joe Haeg, Connor McGovern, Evan Boehm and Joe Dahl are possible mid-round O-line targets. The defensive tackle depth is likely to extend into round four and beyond — it’s a deep class. The Seahawks are meeting with Jonathan Bullard, so what does this mean? Will the Seahawks focus on upgrading their interior O-line? Yesterday we looked at how agility could play an important part in Seattle’s rebuilt O-line. With Russell Wilson’s improvisation skills — blocking on the move is vital. Agility is tested at the combine in the three cone and short shuttle. It was suggested to me that the Seahawks also value explosion on their O-line (represented mainly by the 10-yard splits and broad jump). Of the players we highlighted, Joe Haeg had the fourth best broad jump at the combine, Cody Whitehair the sixth and Connor McGovern the eighth. Germain Ifedi and Joe Dahl also performed well in the broad jump. These players are agile and explosive. There’s a very good chance the Seahawks will go O-line at #26 and we’ll look at why in a new mock draft this week. However, some people have suggested in the comments section that they could go defense in the first two rounds and actually wait until the third round to address the offensive line. It’s unlikely — and I’ll explain why below. I still wanted to use today’s piece to look at this scenario. Whether you like it or not, Seattle’s O-line is set up to run the ball effectively first and foremost. There’s nothing finesse about the scheme or style of play. The Seahawks generally focus on grit and character in the draft — but it seems even more important when selecting offensive linemen. The scheme is just so physically demanding. Much more so than many other teams in the league. It’s no surprise that on top of Russell Okung’s regular issues, James Carpenter, Max Unger and Breno Giacomini missed games through injury. A certain attitude is required to play O-line for this team. It’s an attitude that perhaps doesn’t lend itself to a lot of pampered first round prospects. That’s not to say the Seahawks won’t spend an early pick on the O-line. In Tom Cable’s tenure they’ve already spent a first, second and third round pick on the line. It’s maybe telling though that they’re currently planning to start three undrafted free agents and a fourth round pick unless the rookies come in and win jobs immediately. Perhaps Cable likes the mindset of a guy with something to prove? A player not earning millions — someone who maybe appreciates they don’t know everything already? Someone not only willing to be coached up — but someone also willing to do the hard graft this scheme requires? Some first round prospects will have that attitude. Some won’t. Yesterday we identified three solid options for the Seahawks that could be available in rounds 2-3. We can perhaps add one more name to the list. Tony Pauline is currently projecting Joe Haeg in round three, Connor McGovern and Evan Boehm in round four and Joe Dahl in rounds 4-5. With the Seahawks picking at the end of each round, there’s a chance they’ll have to take these guys a little earlier than projected here. Does Haeg make it to the end of the third? Do they take the two Missouri blockers? Do they consider Joe Dahl? All four players are versatile, tough, good in the run game and play with a spark. If the Seahawks want to add competition to the interior line with players that can also play tackle — this could be a way to do it in round three. Kip’s information highlights a key factor. None of the Super Bowl winning teams in recent seasons fielded an elite performing offensive line. The Patriots’ stats in 2014 were undoubtedly more indicative of a top-tier passing game led by arguably the greatest quarterback to play the game. Alternatively, it’s the teams playing great defense that have generally prospered. Even the Packers, impressively led by Aaron Rodgers in 2010, had the #2 ranked defense in the league and top ranked passing defense. When you consider the two starting O-lines in this years Super Bowl, it further illustrates the importance of defense and not necessarily the offensive front. The four offensive tackles starting in Super Bowl 50 were Michael Oher, Mike Remmers, Ryan Harris and Michael Schofield. How many of that quartet are emphatically better than Garry Gilliam and J’Marcus Webb? That said — the Seahawks are still likely to want much greater O-line competition in camp than they had in 2015. The big question is whether they feel they can achieve that waiting until the 90th pick in the draft? So after all of that, why is it unlikely to happen? There’s no guarantee the players you want for the O-line will last until the back end of round three. Imagine if you take two defensive prospects in rounds 1-2 — and then your guys quickly leave the board. Is it really worth failing to address the O-line sufficiently by rolling the dice in this way? After all — it’s not like the Seahawks are talent deficient on defense. They still have Michael Bennett, Cliff Avril, Bobby Wagner, K.J. Wright, Richard Sherman, Earl Thomas and Kam Chancellor. This is a core group any team would be proud of. Add in the expected progression of Frank Clark, the fact you kept Jeremy Lane and Ahtyba Rubin and the likely addition of at least one highly drafted rookie — and there’s no real reason to ignore the offensive line and take any risks. Also, if the Seahawks want to add two offensive linemen (which seems pretty likely) before the inevitable dip in talent (which is expected to occur after round three) — going DEF-DEF-OL-OL would mean pushing running back into day three. They might be comfortable with that — but it’s not a great class of runners. If you take two O-liners and a defensive player with your first three picks — you at least have the flexibility to consider running back in round three. Even if it’s unlikely, what would a double-dip defensive draft look like? It would probably mean something like Jonathan Bullard (DE, Florida) at #26 and Kyler Fackrell (LB, Utah State) at #56. Then they would have to hope two of Joe Haeg, Connor McGovern or Evan Boehm are there in round three — or only take one offensive lineman and hope someone like Joe Dahl lasts until the end of the fourth. The idea of adding two guys like Bullard and Fackrell is very appealing. It’s a nice thought as long as the O-line options were there in round three. It’s just such a big gamble and surely one the Seahawks won’t take. There’s one other thing to consider on this subject. You can certainly make a case for Jonathan Bullard being Seattle’s first round pick. Ditto Sheldon Rankins. There is at least some chance neither player will be available at #26. And when you consider the alternatives — all of the better players in that late first round range play offense. It’s not improbable for Cody Whitehair, Germain Ifedi, Taylor Decker, Ryan Kelly and Shon Coleman to all be available. Two or three certainly will be. Pair this with the overall depth on the defensive line this year and the possibility Fackrell lasts until #56 — and it pretty much makes sense for the Seahawks to go O-line first and defense second. Either way — going OL-DL or DL-OL in the first two rounds feels almost inevitable. It seems unlikely they wait on either area until round three. Address both needs in the top-60 and at least you aren’t going to miss out altogether. There’s a tendency to concentrate on forty times, splits, the vertical and broad jumps at the combine. Less time is afforded to the short shuttle and three cone. In many ways these tests are more important than the forty yard dash. The majority of NFL plays require short-area quickness and the ability to change direction — not straight-line speed. The short shuttle measures change of direction and agility. The three cone reveals straight line and linear power, change of direction, ‘braking’ and regaining top speed. Agility testing is even more crucial these days for Seahawks offensive linemen. Russell Wilson’s mobility and ability to improvise demands the ability to react and adjust on the move. They often aren’t blocking straight ahead for a pocket passer like Peyton Manning. It’s probably one of the reasons they generally look for tackle converts to move inside. They’re used to blocking on the run. We’ve focused a lot on Germain Ifedi because he had a terrific vertical jump of 32.5 inches at 324lbs. His overall size, length (6-6, 36 inch arms) and terrific physique make him an appealing option. Yet it’s worth noting the players who performed better than he did in the agility tests. It could be important. Ifedi didn’t run a three cone at the combine for some reason but did manage a 4.75 short shuttle — good for 22nd among offensive linemen. He had the third best three cone (7.32) and the eighth best short shuttle (4.58). He also had the sixth best split in the forty (1.73). His vertical jump was disappointing (25.5 inches) but in terms of short-area explosion and agility — it’s easy to see why he faired so well as a left tackle at Kansas State. Haeg’s 7.47 three cone was the fifth best and he impressed in the short shuttle too with the third best time (4.47). Like Whitehair he disappointed in the vertical jump (27.5 inches) but had a good split in the forty (1.75). He’s another player who has the agility and reaction speed that suits Seattle’s O-line. With the seventh best three cone (7.50) and 14th best short shuttle (4.65) — McGovern didn’t test as well here as Whitehair and Haeg. However — he had an explosive vertical that topped all offensive linemen (33 inches), had a really good split (1.72) and managed one of the best broad jumps (9-1). His strong, explosive base perhaps lends itself best to center in Seattle’s scheme — but he’s still pretty agile. While everyone raved about Ryan Kelly’s athletic performance — he actually ran a slower three cone than both Boehm (7.52) and Nick Martin. We know the Seahawks worked out both McGovern and Boehm and we shouldn’t sleep on either. Mizzou’s center added a 4.69 short shuttle which was quicker than Ronnie Stanley, Christian Westerman and Willie Beavers. Jason Spriggs (T, Indiana) ran a 7.70 in the three cone. That’s considerably poorer than the four prospects listed above. It’s strange because Spriggs ran a 4.44 in the short shuttle — the second best time among offensive linemen. There’s such a difference between the two tests it’s hard to determine what it tells us. Ronnie Stanley (T, Notre Dame) had two horrendous agility tests. He managed a wretched effort of 8.09 in the three cone and an equally bad 4.90 in the short shuttle. For all the hype about Stanley in the top-15 — these are really bad numbers. Four of the top five here were taken before Seattle’s first pick. Jarvis Harrison at #4 lasted until round five and spent 2015 on the Jets practise squad. The Seahawks drafted #6 on the list — Mark Glowinski — and likely had a lot of interest in #7 Mitch Morse. Again, the top three prospects were off the board before Seattle’s first pick. Fisher, Marpet and Morse could’ve been strongly considered by the Seahawks in round two. Ty Sambrailo at joint 6th was also off the board and he managed the same time as Mark Glowinski. When you look at the two groups — Cody Whitehair compares very well. His three cone would’ve been #2 to only Jake Fisher a year ago and his short shuttle is exactly the same as Mark Glowinski’s. Joe Haeg would’ve ranked in the top three in both tests last year. It’s unclear whether the Seahawks are willing to change their approach at guard. In the past they’ve used bigger left guards weighing in the 320lbs range (James Carpenter, Justin Britt, Alvin Bailey). It was interesting, however, that Terry Poole was drafted a year ago seemingly to compete at left guard and he weighed only 307lbs. Whitehair’s tackle experience, run blocking, toughness, consistency and agility make him something of an ideal prospect for the Seahawks. The only thing letting him down is length — and that could be a sticking point. He has 32.5 inch arms. In the Pete Carroll era, the Seahawks have never drafted an offensive lineman with sub-33 inch arms. We know they have strict size ideals at cornerback (32 inch arms, have to be taller than 5-10). They might feel the same way about their offensive linemen. They haven’t quite spelled it out like they have at cornerback. Perhaps there’s a glimmer of hope for anyone who wants Whitehair to be drafted at #26? Seattle’s ideal size for a quarterback isn’t 5-10. They drafted Russell Wilson anyway because of his extreme talent. So while they are very strict about their ideals — there’s possibly a chance they’ll compromise for the right guy. For what it’s worth, Joe Thomas also has 32.5 inch arms. I mentioned yesterday that I watched Whitehair vs Emmanuel Ogbah and that’s another reason why I wanted to write about him today. He shut Ogbah down in that game, forcing him to switch sides so he could have a better showing against the right tackle. His balance, strong base, power at the POA and complete body control is reminiscent of Zack Martin during his Notre Dame days. Martin also had sub-33 inch arms and played left tackle but had an immediate impact as a pro after switching to left guard. Whitehair might go higher than a lot of people believe for that very reason. There are teams in the late teens and early 20’s that might believe he can be that plug-in-and-play guard. The type you don’t have to worry about for the next eight or ten years. His lack of length and the hulking physicality of Germain Ifedi moved us away from considering a guy like this. Keep him on the radar for now. He’s 0.5 inches in arm length away from being virtually the ideal pick for this team and his excellent agility is a key reason why. If they go in a different direction at #26 (especially if the don’t draft an offensive lineman in round one) — the likes of Haeg, McGovern and Boehm should also be monitored closely. It might even be a pretty accurate prediction to suggest they’ll try and draft two of Whitehair, Haeg, McGovern and Boehm. A Seahawks contingent travelled to the North Dakota State pro-day recently where Haeg performed and they also worked out McGovern and Boehm at the Missouri pro-day. If the Seahawks want competition and options at multiple spots on their offensive line — that’s another reason why this quartet make sense. Players like Ifedi and Shon Coleman also have the potential to play tackle or guard. If they draft a prospect like Jonathan Bullard in round one, they could look at Haeg, McGovern and Boehm in rounds 2-3. Remember — the Seahawks draft for their team and will take guys that fit their system even if the pick is considered a reach. If they draft Whitehair (or another offensive lineman like Ifedi) in round one they could consider a defensive lineman like Willie Henry in round two (he had a quicker short shuttle than Bullard despite weighing 18lbs more). It’ll also be very interesting to see how Kyler Fackrell tests in the agility drills. He didn’t do them at the combine or the Utah State pro-day, probably due to some lingering injury issue. If the Seahawks don’t like the DE-DT options in this class there’s every chance they’ll just add an EDGE or a player who can compete for the role vacated by Bruce Irvin. Fackrell is a splash-play specialist who impacts the passing game. He’s a high-energy, big effort prospect who had an excellent broad jump (10-1) at the combine and managed a 1.62 split. He’s also long at 6-5, 245lbs with +33 inch arms and massive hands. They visited with Shea McLellin before he signed with the Patriots. Fackrell would provide a similar option and he might be there at #56. I watched BYU twice in 2015 but didn’t see the Fresno State game (see above). Yesterday I watched it for the first time and he basically took over the game. Granted it was a 52-10 beat down. Yet Kaufusi’s three sacks, TFL’s in the run game and a blocked kick just jumped off the screen. It was similar to the type of performance we used to see from Margus Hunt at SMU. At 6-8 and 295lbs, Hunt was the #53 pick in 2013. Like Hunt, Kaufusi is also an older player entering the draft. He’ll be 25 as a rookie. There are key differences between the two though — and this is why Kaufusi might end up having a superior pro career. For starters he’s more consistent on tape. Hunt flashed occasionally but watching Kaufusi — he’s more of a week-to-week impact player. He’s also a better athlete. Kaufusi ran an elite short shuttle at the combine at 4.25 seconds. He also had a 7.03 in the three-cone. He’s 6-6 and 285lbs. Bosa is 6-5 and 269lbs, Calhoun 6-4 and 251lbs and Lawson 6-2 and 259lbs. Kaufusi moves as well as the top edge rushers in this class despite being freakishly bigger. He’s basically as agile and quick as Calhoun despite a 34lbs weight difference. J.J. Watt, for what it’s worth, was 6-5 and 290lbs at his combine and had a 4.21 in the short shuttle and a 6.88 in the three-cone. There’s a 0.04 difference between his forty time and Kaufusi’s. Ziggy Ansah had a 4.26 in the short shuttle and a 7.11 three cone (he also had an incredible 4.56 forty and a 1.62 split). Let’s state the obvious — these are not bad comparisons. The Seahawks love top-level athletic traits. They also like production (he has that) and grit (he’s a coaches son and plays that way). That said — I’m not convinced he’s anything more than an edge rusher. Unlike Watt, there isn’t any real evidence of him moving around the line and impacting plays. He just wasn’t used in that way. He has the frame to do it but might need to add a little more bulk. If Seattle’s desire is to find a good inside/out rusher — you’d be taking a chance that Kaufusi can make that adjustment. There are two types of great NFL rusher at the moment — smaller with elite quicks (Mack, Von Miller) and the super-athletic big men (Watt, Ansah). Physically Kaufusi compares well to the bigger, athletic guys. The issues on tape are pretty obvious. Because of his height he struggles with leverage when he doesn’t stay low. He has a tendency to play high and when this happens he just doesn’t have an impact. There’s a bit of fire to his play and his effort is excellent but he doesn’t chew glass. He’s not necessarily a war daddy but he equally won’t back down. You get the sense he got by on athleticism in college and he’s not technically the best pass rusher. There’s no real evidence of a plan in place — he doesn’t take three plays to set up a blocker and he doesn’t have a repertoire. At the next level, when his athleticism is less dominating, he’ll need to be more nuanced. His first priority needs to be to work on his hand placement. That said it would be interesting to see how he’d fair playing next to Michael Bennett, Cliff Avril and Frank Clark. He’s not going to face the double teams he had in college and his agility is good enough to make teams pay 1v1 off the edge. In a draft class without many freaky athletes Kaufusi deserves the description. He could be an option in round two if the Seahawks go O-line at #26. After talking about Bullard over the last few days, I went back and watched Florida’s games against Ole Miss and Alabama. While he is very capable of playing end and tackle and moving around the line — Bullard isn’t a splash play specialist. In the two games he didn’t have a major impact — he just played well. He perfectly read an option play to drop a running back for a big loss against Ole Miss and he had a clear up sack against Alabama. Jake Coker scrambled away from pressure in the backfield, tried to extend the play and ran into Bullard. It was good to watch him again if only to remind myself what I thought during the season. Bullard is a high-effort, intense defensive lineman but you don’t watch the tape and see anything particularly special. When he lines up at end he wins shooting the B-gap and timing snap counts. There’s not much variation. Working inside he can barrel his way into the backfield but it’s forceful rather than quick/twitch. At the next level he isn’t likely to just be able to get after the B-gap in the same way — he’s not an edge rusher by any stretch of the imagination even when he lines up at DE and he might end up making a permanent switch inside. That’s fine — but are the Seahawks looking for a smaller interior rusher in round one who doesn’t feature in base (and therefore plays a smaller percentage of snaps)? If the Seahawks want a stout, consistent DE who plays the run well and doesn’t get shoved around — Bullard will do that. He’s a good run defender at DE. He can set the edge and his ability to close is exceptional. When he sees the ball carrier in front he’ll wrap up and finish the tackle. He never misses a tackle — period. He also does a very good job staying disciplined and filling his gap — something the Seahawks cherish. But he isn’t a special pass rusher. He has a nice athletic profile but is he an 8-12 sack guy like Cam Jordan? I’m not convinced he will be. The Seahawks might be content with a 5-7 sack defender — essentially replacing the lost production from 2015 that they had in 2013-14 with Clinton McDonald and Jordan Hill. The question is — will they see that as worthy of a first round pick? As an individual with his competitive nature, the chip on his shoulder, the intensity, the discipline and the run defense — Bullard’s a Seahawk. But they also seem to like unique traits in round one with major upside. Bullard, with respect, might only ever be a stout, solid run defender who gets you a handful of sacks a season working inside. It’s possible he might be the type of player they’d happily take at #56 or round three. They might prefer someone with a greater upside in the first round. Bullard is a really fun player to watch, a guy who is easy to like and he’s not a slouch athletically. He’s a former 5-star recruit and he did well at the combine. There’s a pretty good chance you’ll get a good player if you draft him. Is he capable of being a great player though? That’s what the Seahawks would have to consider if they wanted to take him at #26. He might not be special enough to warrant a first day pick. I watched Ogbah vs Kansas State yesterday and this assessment is pretty much spot on. Cody Whitehair basically had his lunch money. Ogbah was happy to be blocked and probably thanked Whitehair for not being too mean. Time and time again the pair engaged, Whitehair contained Ogbah and finished the block. There was no counter, no physicality, nothing. Oklahoma State adjusted and moved Ogbah to take on the right tackle. He got a sack and did a big boy pose. It’d would’ve been easier to stomach had he not received a wedgie earlier by a guy who will inevitably move to guard or center in the NFL. His athletic profile is excellent but if Ogbah is going to succeed at the next level he needs to up the ante. He needs to play with more fire, he needs to work on counters and hand placement and he needs to show more effort. It’s tempting to look at a 13-sack season, a 1.5 split and a terrific forty yard dash for his size and get excited. It’s worth noting, however, that despite weighing 15lbs less than Kaufusi, Obgah’s agility testing led to a 4.50 short shuttle and a 7.26 three cone. Kaufusi, as we noted above, had a 4.21 and a 7.03 at 6-6 and 285lbs. I'm told #Florida DL Jonathan Bullard has visits and/or workouts on the books with the #Titans, #Seahawks, #Raiders and #Falcons. This isn’t a big shock. Seattle’s two key needs — and the most likely picks in the first two rounds — are O-line help and a DE/DT hybrid. Bullard ticks so many boxes. He can play DE in base and shoot the B-gap. On third downs and in nickel he can move inside. Seattle met with Mario Edwards Jr a year ago and drafted similar inside/out players in Cassius Marsh and Frank Clark. They’ve since dropped weight — so presumably the search continues for that type of pass rusher. Edwards Jr was hard to judge in terms of his range. Jason La Canfora made a strong case for him being a first rounder last year. He was the #35 pick to Oakland. Bullard is getting similar grades. As we noted yesterday, Tony Pauline thinks he’ll go in round one while others insist he’s a second or third round pick. It really depends on scheme. Bullard’s not an automatic fit in the 3-4 and he’s equally not suited to an orthodox 4-3. He’ll do his best work moving around the line. It’s not surprising that Oakland (with Ken Norton Jr as their defensive coordinator) took Edwards Jr and Bullard is equally a good fit in Seattle’s defense. It’s not just the scheme fit that will likely appeal to the Seahawks. Bullard has tremendous grit and spirit. He carried a major chip on his shoulder in 2015 after getting a mid-round grade from the draft committee. He admitted he returned to Florida to prove he was better than that. He’s a former 5-star recruit — something the Seahawks seem to like. Bullard performed well at the combine and plays with a real fire and intensity. He doesn’t take snaps off and if the Seahawks really want to become the bully again this year — here’s a guy who can help them get there. There aren’t many DE/DT hybrid’s in this draft class. Sheldon Rankins is probably the ideal but he’s expected to go in the top-15. Bullard might be the only other option for Seattle otherwise they’ll just look elsewhere (at maybe a pure edge or a DT). For that reason it could make Bullard a very serious option at #26. They won’t be able to get at the top offensive tackles in rounds 2-3 — but there are likely to be interior line alternatives such as Connor McGovern or the rising Joe Haeg. 1. Are Rankins or Bullard available at #26? “I don’t think we’ve nailed it yet. I think this needs to be a really competitive spot again, and we’re going to work really hard to build it up. For the course of the season, we weren’t consistent enough. They might be prepared to see how far Bullard lasts and consider trading up in round two. That enables them to get their guy on the O-line at #26. Either way, the good money is on an OL/DL pick to start off the draft. Running back (did I mention Tyler Ervin is pretty good? ), further O-line competition and possibly receiver will also come into play starting in round three. How will the Seahawks approach adding a defensive lineman? This is the second time I’ve seen someone suggest that the Seahawks want an inside-out type rusher as opposed to a pure edge or defensive tackle. The Seahawks are minded to shut down the run with cheaper, bigger bodies in base. Then it’s time to unleash the hounds. A player of this description is flexible enough to play a high percentage of snaps. You don’t need to take them off the field in base (they can play end) and they can move inside in nickel or nascar. If the idea is to get bang for your buck — this type of defender makes sense. Since Bennett joined the Seahawks, it’s generally the type they’ve gone for. Even though Cassius Marsh and now Frank Clark have dropped weight — they both played a similar role in college. That said, I doubt they’re married to the idea. If the draft provides an opportunity to add a talented defensive tackle instead so be it. This could be as much about an ideal rather than a priority. DeForest Buckner will be long gone, Robert Nkemdiche is possibly going to fall out of the first round and might not be on Seattle’s board. Sheldon Rankins seems likely to go in the top-15. Jonathan Bullard is one to monitor as we’ve previously discussed. He’s also one of the hardest prospects to assess in terms of draft range. He won’t fit several schemes. He’s not an ideal five-technique and yet he plays his best football off the edge working the B Gap. With the Seahawks generally using 3-4 personnel in their 4-3 scheme — that’s probably a good fit. Other teams might see him as a tweener. Opinions are clearly mixed. Tony Pauline’s first round grade probably matches up with several teams in the league — as does Bob McGinn’s source suggesting the second or third round. How far do the teams let him fall? Is he the best option for the Seahawks to fill this need? Pauline has Oklahoma’s Charles Tapper in round two. He also played inside and out at college and blew up the combine with a surprisingly brilliant athletic display. He was one of the few D-liners to post a 1.5 10-yard split and he ran the fastest forty (4.59) despite weighing 271lbs. As an athletic profile, that’s outstanding. He also has 34.5 inch arms and posted a 34 inch vertical. Athletically he might as well be wearing College Navy right now — but here’s the thing. When we all thought he was probably a 4.7 runner his tape was palatable. Now that we know he’s an athletic freak of nature you kind of want to see more. You want to see him dominating — because we know he’s so much better physically than anyone else on the field. The Seahawks might be able to buy into his upside — but he never got close to the kind of performances Frank Clark showed at Michigan. He dominated. He is a three-year starter who has the length and two-gapping ability to fit as a 5-technique in a base 3-4 defense. He continues to develop as a pass rusher and came on late in the year with all seven of his sacks coming in the final six games. Tapper projects as a fringe Day 2 prospect who should add immediate depth and quickly develop into a starter along a front line. Ronald Blair III might come into focus again. He didn’t have a great combine but he has the size (6-2, 284lbs, 34 inch arms), first step quickness and he performed well in the short shuttle (Blair III’s 4.53 beat Bullard’s 4.56). He has his supporters but round two might be a bit rich. Sheldon Day worked inside and out for Notre Dame. His production isn’t great (four sacks in 2015) and although he’s a very active player, he didn’t spend a lot of time in the backfield. He’s also small in stature at 6-0 and 293lbs with 32.5 inch arms. He did manage a 1.69 split which is decent for his weight and he had a very nice 4.50 short shuttle. It’s hard to imagine a player of his size on Seattle’s D-line, however. Jihad Ward likely isn’t athletic enough for Seattle, Bronson Kaufusi might be more of a pure edge and after that the options aren’t great. So it brings up two thoughts. Do they like a guy like Bullard enough that they can’t leave the draft without him? Remember, the Seahawks identify areas to get ‘their’ guys. If Bullard gets the special ‘we have to have him’ treatment he could be their pick at #26. If he’s a guy they like but can live without because they want to go O-line first — then they’ll have to see what’s available in round two. Getting a guy they like on the O-line and D-line (one way or another) is probably a safe projection for the Seahawks in rounds one and two. If the top DE-DT’s are off the board, other D-liners might come into focus. McShay had UCLA’s Kenny Clark on the board at #56. Clark had one of the better workouts at the combine — looking sharp throughout the drills. He’s 29lbs heavier than Bullard but had a similar 10-yard split, a forty time that was only 0.13 seconds slower and there was 0.07 seconds difference in the short shuttle. They are different players but Clark’s athletic profile for his size could be appealing. He’d provide a like-for-like replacement for Brandon Mebane in terms of style and position. He’s a classic one-technique. Adding him to Seattle’s D-line rotation could give them a nice, cheap Mebane replacement for the next few years. Willie Henry’s technique needs work (drops his head way too much) but he also does things very few guys his size can do. In round two, he could also be an option. He’s close to Frank Clark. We’ve noted Kaufusi — who aced the agility drills at the combine despite being 6-6 and 285lbs. Fits multiple schemes. Late first, early second. Like him. Plays more 3-technique but he can play nose. Maliek Collins also had a great short shuttle and is a former wrestler. Joel Heath’s athletic performance led us to wonder if he could be their next O-line convert — but could they work him into their D-line rotation as a surprise pick? Quinton Jefferson also tested well for agility. Adolphus Washington, aka the forgotten man, didn’t have a good combine on top of some character concerns late in the season but he might be the closest comparison in this class to Malik Jackson. He could easily be in the top 50 but he is such a dog. He’s an underachiever. The Tweet at the top of the page insinuates the Seahawks wouldn’t be interested in Emmanuel Ogbah based on scheme fit — but athletically he’s an intriguing proposition as more of an EDGE. It seems likely that the Seahawks will use their first two picks to address the trenches, whether it’s an O-line then D-line combo or vice versa. While adding to the offensive line might be Pete Carroll’s self-confessed priority — getting another DE-DT hybrid (and some extra depth at running back) might be next on the list. #Mizzou OG Connor McGovern now talking with scouts from the Seahawks. This isn’t a big surprise. If there are two players that might be ‘can’t leave the draft without’ types for the Seahawks — it could be McGovern and Tyler Ervin. Three teams brought assistant coaches who put offensive linemen Boehm and McGovern through a lengthy series of position drills: Patriots OL coach Dante Scarnecchia, Colts assistant OL coach Joe Gilbert, Seahawks assistant OL coach Brennan Carroll and Bengals offensive quality control coach Robert Couch. The Seahawks and Chiefs were among a few teams that had multiple representatives on hand. It’s further evidence they’ll once again be looking for major upside with their offensive line picks. There’s a real shortage of unique athletes playing O-line in college. This is why it’s easy to assume the likes of McGovern, Germain Ifedi and Le’Raven Clark could be on their radar. It’s also why they might look to convert Michigan State’s Joel Heath to the offense. This isn’t the first time someone has mentioned that the Seahawks want to add another Michael Bennett type to their roster. Not to replace Bennett, mind, but someone who can play end and still move inside for the key downs. Rather than a pure edge or interior run stuffer — a DE that can move inside appears to be their main desire on the D-line. I’ve chosen two scenarios for rounds one and two. One that will satisfy those wanting the #26 to be spent on an offensive lineman — and one that will satisfy those wanting to see a pass rusher. Ifedi is huge (6-6, 324lbs, 36 inch arms) but he’s also a dynamic athlete (second best vertical among O-liners at the combine) and he looks like the Hulk. He’s ranked #1 by SLA among offensive linemen and physically he’s in the 97th percentile for NFL lineman. Mock Draftable also compares him to Kelechi Osemele. A pick like this would allow the Seahawks to look at Ifedi and J’Marcus Webb at tackle and guard and make a decision on who starts where during camp. Starting Ifedi at left guard would give Tom Cable an athletic mauler. He’s a cheaper alternative to Osemele. I suspect the Seahawks would like to add another DE who can kick inside on third down. That’s the ideal role for Bullard. PFF ranked him as the #1 interior run defender in college football for 2015. He impressed athletically at the combine with a decent three-cone (7.31) and vertical (32 inches). He also has good size (6-3, 285lbs, 33.5 inch arms, 10 inch hands) and has the right attitude for this team. Bullard returned to Florida in 2015 because he wanted to prove he was a better player than the mid-round grade he received from the draft committee. If the Seahawks take a pass rusher in round one — this surely has to be an O-line pick? McGovern played left tackle for Missouri, following in the footsteps of back-to-back second round picks Justin Britt and Mitch Morse. McGovern is closer to Morse athletically — he’s ranked #4 among linemen by SLA and in the 87th percentile. He had the best vertical at the combine (33 inches) and excelled in the three cone and short shuttle too. He’s incredibly powerful and can squat 690lbs five times. The Seahawks love grit, physicality, athleticism and tackle experience on their O-line. McGovern could line up at guard or center and act as a tackle in an emergency. As noted above, I’ve got a hunch the Seahawks want a D-end in base formations who can kick inside. Frank Clark was originally posted for that role but he’s now losing weight. They might reach a little bit for BYU’s Bronson Kaufusi. He’s 6-6 and 285lbs but managed a stunning 4.25 short shuttle and an impressive 7.03 in the three-cone. He had 11 sacks in 2015. He matches Seattle’s ideals for athleticism, size and production. You want to see him chewing glass a little bit more but that aside he can move along the line and is a day two athlete for sure. He’s the #3 SLA prospect for defensive linemen and in the 96th percentile. Utah State’s Kyler Fackrell is smaller but could be another option. He’s more akin to Shea McClellin — who visited Seattle before signing with the Patriots. Maybe the #56 pick could be used in a possible trade, similar to the Arizona’s deal for Chandler Jones? Everything about Ervin screams Seahawks. He’s a dynamic athlete (4.41 forty, 10-10 broad and 39 inch vertical), he has tremendous production (1601 yards, 13 touchdowns in 2015), he’s a team captain and he’s understated. On tape he runs hard despite a 5-10, 192lbs frame and he doesn’t shirk running between the tackles. He has that gliding speed the Seahawks love when he finds a crease and he goes through the gears to max-out gains. He carried his team on his back. Lance Dunbar recently visited Seattle and it hints at the incorporation of a pass-catching back moving forward. Don’t sleep on Ervin’s ability to be another Brian Westbrook. This pick would be the #90 overall selection — Westbrook is a former #91 overall pick by the Eagles. Ervin leaps off the tape and his combine workout was silky smooth. He might be the guy they feel they can’t leave the draft without. Whatever they do in rounds 1-2 — a second offensive lineman in round three seems likely. Again it’s likely to be someone that can compete at a couple of different spots. Glasgow in this instance has played center and guard for Michigan. His coach Jim Harbaugh suggested he deserved a first round grade before the Shrine Game. He’s a really tough, tone-setting lineman. He’s a no-nonsense type. He’s almost identical in size to Max Unger (6-6, 307lbs) and he performed well in the three-cone and short shuttle. He’s #10 for SLA just ahead of Christian Westerman who could be another option for the Seahawks. Glasgow has previously had issues with alcohol but he’s worked to address that — even moving in with his grandmother. He’s had to battle a bit and succeeded — the Seahawks tend to like that. Plus he’ll hit you in the chest. This has been a range where the Seahawks have taken receivers in the past (Kris Durham, Chris Harper, Kevin Norwood). They lack a big, athletic target following Chris Matthews’ departure and Ricardo Lockette sadly might not play again. Cajuste is extremely close to Doug Baldwin and would fit in immediately. He’s pushing 6-4 and 234lbs but he’s explosive — recording a 36 inch vertical and a 10-3 broad jump. He also has length (33 inch arms) and big hands (11 inches). He’s the #1 SLA receiver and he’s in the 91st percentile compared to the rest of the NFL. His production isn’t great but neither was Kris Durham’s. He did make some clutch catches in a run-first offense. The Seahawks don’t need him to post 1000 yards — they just need him to play a role, block and make the most of the few targets he gets. That’s what he does well — especially the blocking bit. The Seahawks nearly always take a cornerback in this range. That player needs to have +32 inch arms and be a certain height. Elliot is 6-0 and 188lbs with exactly 32 inch arms. He ran a 4.55 at the combine which is similar to Richard Sherman. He did post an explosive 41 inch vertical, a 10-5 broad jump and an incredible 3.93 short shuttle. He’s the #5 SLA cornerback and in the 85th percentile. Physically he’s the type of corner they can work with. He had two interceptions in 2015. Heath is a natural leader and a great character. Could he be Seattle’s latest O-line convert? He’s currently 6-5 and 293lbs with 34.5 inch arms. He matched Connor McGovern’s vertical jump of 33 inches and his 4.52 short shuttle would’ve been fourth among O-liners. Given his high character and willingness to adapt in the past (he started at defensive end but added 30lbs to kick inside) he could be primed for a move to the O-line. Mock Draftable says he compares physically to Cam Erving — a first rounder last year who similarly moved from defense to offense at Florida State. The Seahawks could draft Reynolds based on his athletic profile and see how he fits in. That could be at receiver or running back. He had a terrific college career — finishing 5th in the Heisman voting and breaking a FBS record for 88 career running touchdowns. The Seahawks took an interest in Balducci at the Shrine Game. Seahawks coaches were also heavily involved in his pro-day workout recently. He could be another camp body for the D-line competition.